It’s been almost 4 years since MVM started down the Monogatari path, when they released Bakemonogatari on DVD and Blu-ray. Since then we’ve had Nisemonogatari, Monogatari Season 2, Nekomonogatari Black, Tsukimonogatari and Hanamonogatari. That’s a lot of Monogatari, but its popularity among the fanbase is most certainly deserved, combining Studio SHAFT’s quirky visuals with playful, witty, and intelligent scripts. If Nisioisin keeps writing the light novels, and SHAFT keeps on animating them, then fans will keep on buying, and I’m sure that we’ll keep on getting them here too. It’s rare to see a franchise mostly maintain a level of quality and excellence for so long, but that’s definitely a reason why I’ve been looking forward to the next instalment. This time it’s a mini-series that’s coming in two parts, and we begin with Owarimonogatari Part 1. That seems perfectly logical, but with the Monogatari franchise’s scattershot narrative and wayward timelines, I wouldn’t have been surprised if we had started with Part 2. 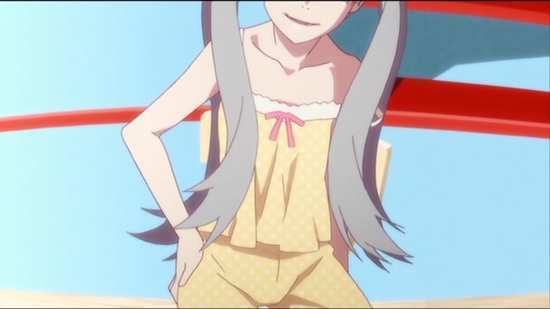 We go back in time for Owarimonogatari, not long after the events of Bakemonogatari, back when the enigmatic Ougi Oshino (Meme Oshino’s niece) first transferred to Koyomi Araragi’s high school. 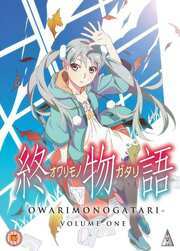 Seven episodes of Owarimonogatari are presented on this dual layer DVD disc from MVM. You can also get Part 1 on Blu-ray on the same day. 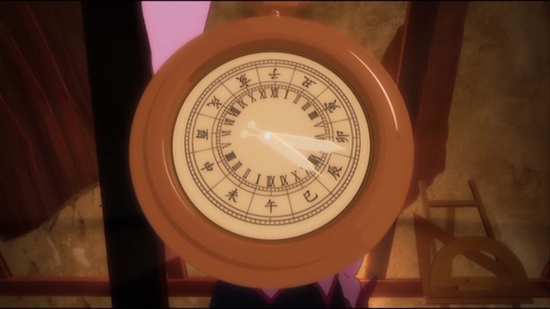 Araragi is drawn to supernatural mysteries, so when Ougi Oshino comes to him with a hand drawn map of the school which purports to show a hidden room, he’s happy to investigate. Which is why he winds up trapped, sealed into the classroom with Ougi. The room is familiar too, jogging a memory that he has suppressed for the last two years. In his first year in high school, there was an incident with a stolen maths test, and the maths study group, and a girl who hated his guts named Sodachi Oikura. That incident shaped his views of people, shaped who he is today, and Ougi’s going to help him remember. Sodachi Oikura is back in school after two years absence, and she still despises Koyomi Araragi. Why does she hate him, and why can’t he hate her in return? 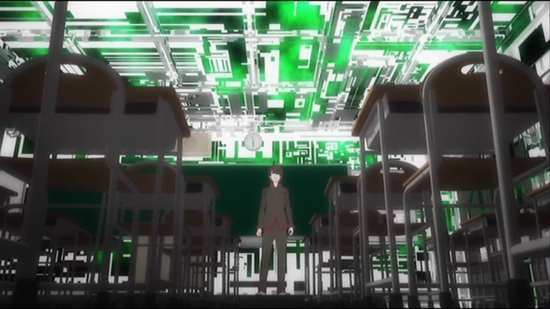 There are more questions to be answered, and those answers lie in a shoe locker in Araragi’s old middle school, and a ruined house where he once used to go to be tutored in maths by a mystery girl. And once again, Ougi Oshino is there to guide him through his past. That was a short stay at school. After the heated confrontation with Araragi, as well as connecting with Senjyogahara’s fist, Oikura is absent again. As class representatives, it’s down to Tsubasa Hanekawa and Araragi to sort things out, but once Hanekawa sees the hypnotic effect that Ougi Oshino has on Araragi, she insists that they visit Oikura without Ougi in tow. When Sodachi finally reveals her story, how she first met Araragi, they have another mystery on their hands. The disc loads up a static menu screen. The only extras are the three textless openings, and one textless closing. The usual Fire Sisters next episode previews are unfortunately absent. The Monogatari franchise is nothing if not focused on character development. This is a show that is all about character, about how people relate to each other, how their present lives are affected by events and choices that they made in the past. It’s one of the selling points of the franchise, and makes it stand out among its peers as something special and unique. You might be surprised to realise that one character has lacked for such narrative development, and you’ll be even more surprised when you see who it is. Over all of its iterations, the TV series and the OVA specials that we’ve had so far in the UK, it’s the show’s central character that has lacked for such exploration. 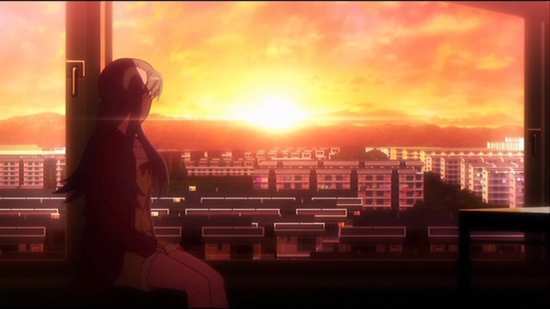 Koyomi Araragi has usually been our eyes into this strange, supernatural suburbia. He’s not exactly an audience proxy, given that he is a recovering vampire, but the stories have always focussed on the girls that he encounters, the problems that they face, and what caused those problems. He’s the guy who stands ready to help, but we’ve always taken it for granted that it’s just his character. We’ve never asked why. Owarimonogatari asks why. 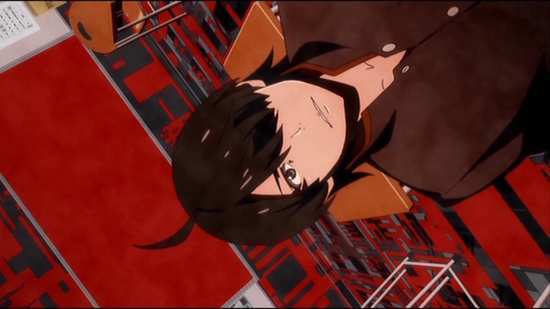 This series flips things a little, and we get to see Koyomi Araragi’s past, see the events that shaped him into who he is today, and understand just why he’s so self-sacrificing and willing to help others. 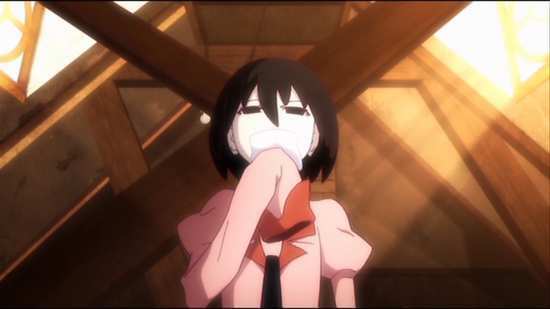 The show also takes a look at another of the Monogatari franchise’s more enigmatic characters, Ougi Oshino, although exactly how revelatory these episodes are into his/her character, you’ll have to decide for yourself. Of course you can’t get too far away from Monogatari’s core premise. There is another girl for Araragi to help at the centre of the story, but as her past is intertwined with Araragi’s past, we get to learn more about our protagonist as a result. One thing that quickly becomes clear, when Ougi Oshino draws Araragi into the first locked room mystery in this collection, is just how sinister and manipulative Ougi is. What makes it all the more sinister is that you just don’t know what game Ougi is playing. 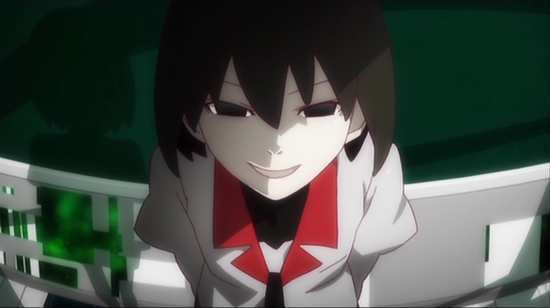 It could be completely innocent, wholly altruistic, but the way that Ougi cajoles, persuades, twists, and hypnotises Araragi into doing the exact opposite of what he wants to, to the point where he starts to think that it’s his idea in the first place, makes you ascribe ominous motivation to Ougi. 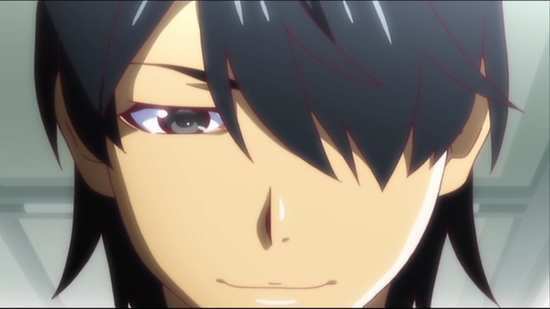 Then again, when the sealed room mystery can only be resolved by Araragi facing a trauma in his past that any sensible person would rather not think about, perhaps a little baleful persuasion is in order. The three stories in this half of Owarimonogatari are all about Araragi’s relationship with Sodachi Oikura, a relationship which he’s practically forgotten as this collection begins. 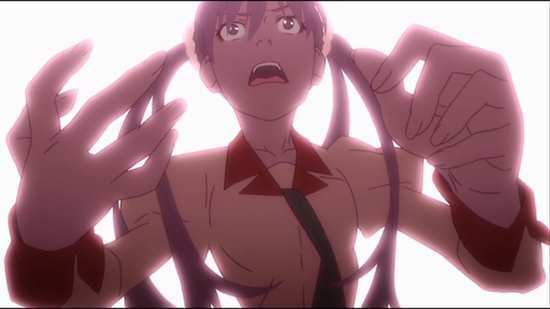 And in true Memento style, we explore Araragi and Sodachi’s shared past in reverse chronology. 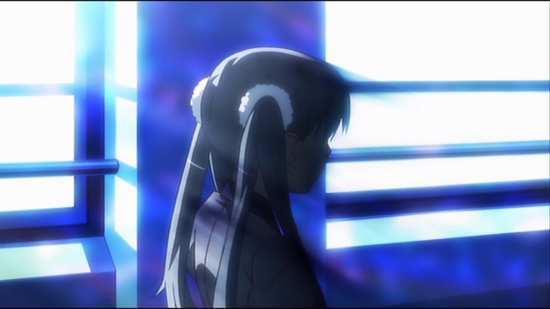 First, the sealed room mystery looks back two years, when Araragi and Sodachi first started high school, and there was a scandal about a stolen maths test affecting the results. 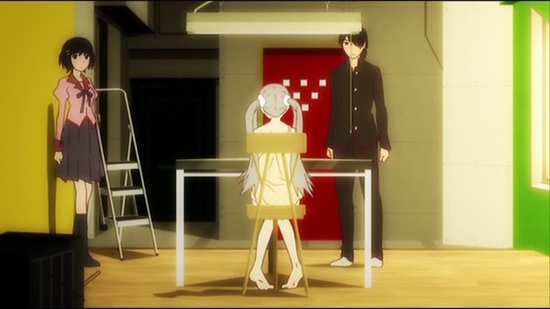 What was clear is that Sodachi clearly detested Araragi, so the consequent student meeting, where they were supposed to discover the identity of the exam thief, was more political than anything, with Sodachi clearly biased against Araragi, setting him up as the leader of the meeting in a way that ought to have implicated him. That the meeting had less to do with detection, and more to do with student politics, coupled with the unexpected outcome, explains to some degree why Araragi kept to himself thereafter, espousing a lack of need for friendship. That doesn’t explain why despite Sodachi’s obvious loathing for Araragi, he doesn’t or didn’t reciprocate, as would be natural. So Ougi takes Araragi on another trip to his past, this time revisiting middle school, back when maths was his weak point, and he worried about failing his exams and letting down his parents. An envelope in a shoe locker leads to a ruined house, where Araragi remembers going to learn maths from a mysterious girl, who could make maths feel like fun rather than a chore. She made him promise to keep the lessons secret, and then one day merely vanished. Ougi makes Araragi take another look at those days, asking just how did this mysterious girl know so much about Araragi’s family, and what girl would invite a boy to a ruined house to learn maths. Obviously the house wasn’t ruined, and just as obviously, the girl was Sodachi, but the first question leads to the final story in this half of Owarimonogatari. 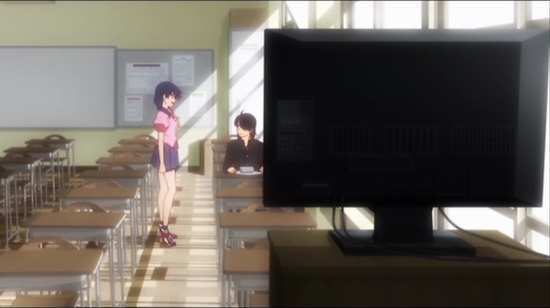 We learn that Araragi’s shared past with Sodachi stretches even further back, but at this point we see that Ougi’s manipulation of Araragi crosses a line, or rather Tsubasa Hanekawa sees it, and intercedes when Ougi tries to join Araragi on a visit to Sodachi’s apartment. For this final story, which takes a little longer to get going as it’s bookended by some more obvious Machiavellian scheming from Ougi, it’s Tsubasa Hanekawa who accompanies Araragi to Sodachi’s apartment, and we find out how Sodachi and Araragi are connected, as well as more about Sodachi’s tragic past. And there’s one final mystery to solve, just how did Sodachi’s mother vanish from a locked room? The obvious answer is one that any sane person would much rather avoid, so it takes Ougi once more to force Araragi to face facts. Although I have to admit, that the imagery that pops up at this time suggests an even more unsavoury answer than the three come up with. It’s hard at this point to consider what the rest of Owarimonogatari will have to offer. It seems that we’ve pretty much gone through the Sodachi Oikura storyline, while how it relates to who Araragi came to be, the events that motivated his life to this point, also seems pretty complete. I guess the only enigma remaining at this point is Ougi Oshino, who in these three stories is more a motivator of events, a demented Sherlock Holmes with the preternatural ability at deduction, coupled with a cruel playful manipulation of others. That is one question remaining to be answered. Just who is Ougi Oshino? As far as the Monogatari franchise goes, Owarimonogatari is a stronger offering than most, as its focus on the mysteries makes it more involving of the viewer. The animation, the writing, and the characterisations are up to the usual standard. I’m certainly looking forward to the second half of Owarimonogatari.